Paul Nurse became Rockefeller University’s ninth president on September 1, 2003. A Nobel Prize-winning biologist, Paul’s research focuses on the molecular machinery that drives cell division and controls cell shape. 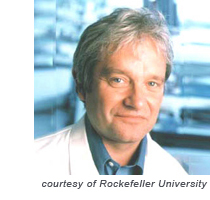 Before coming to Rockefeller, Paul spent over three decades as a research scientist in the United Kingdom, where he was born. His research led to the identification of cyclin-dependent kinase (CDK) as the key regulator molecule controlling the process by which cells make copies of themselves. This has been important for understanding the growth and development of cancer cells. His most recent post was as head of the world’s largest volunteer-supported cancer research organization, Cancer Research UK. In addition to the Nobel Prize in Physiology or Medicine, which he shared with two other scientists in 2001, Sir Paul has won the Albert Lasker Award for Basic Medical Research, as well as numerous other awards and medals. He is a fellow of the Royal Society and a foreign associate of the U.S. National Academy of Sciences, and in 1999 was honored with knighthood in Great Britain for services to cancer research and cell biology. At IDEC, Antonio J. Grillo-López led clinical development of IDEC-C2B8 (Rituxan®, MabThera) approved in 1997 by the FDA for the treatment of patients with low-grade or follicular non-Hodgkin’s lymphoma. At IDEC, he also supervised the development of Zevalin, the first radioimmunotherapy approved for the treatment of cancer. For his medical work he was awarded the Leukemia Society of America Triumph Award, the Cure for Lymphoma Foundation Trailblazer Award and the Peter McCuen Cancer Research Excellence Award from the University of California. In 2004 he received the first Discovery Health Channel Medical Honors Award for lifetime achievements in clinical cancer research. Prior to his groundbreaking work at IDEC, he was Executive Medical Director for International Clinical Research Development at DuPont Merck for five years; Vice President, Clinical Therapeutics and Director, Clinical Oncology Research at Parke Davis (Warner Lambert) for seven years; and was Associate Professor of Medicine in the Department of Hematology and Oncology at the University of Michigan. 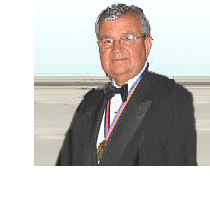 Dr. Grillo-López trained as a hematologist and oncologist at the University of Puerto Rico School of Medicine, San Juan, where he received his medical degree and later founded the Puerto Rico Society of Hematology and the Latin American Society of Hematology. Dr. Grillo-López has authored over 400 publications, primarily in the fields of hematology and oncology, including co-authorship of the current international response criteria for lymphoma. In 2003 he was named “Distinguished Alumnus” of the University of Puerto Rico during its Centennial celebrations. 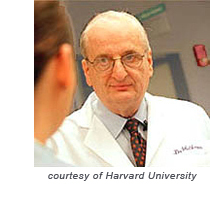 Judah Folkman is widely recognized as the founder of the field of angiogenesis research. He has made seminal discoveries on the mechanism of angiogenesis, which have opened a field of investigation now pursued worldwide. Dr. Folkman’s hypothesis (1971) that solid tumors are angiogenesis-dependent initiated studies of angiogenesis in tumor biology and in disciplines as diverse as developmental biology, ophthalmology and dermatology. His laboratory reported the first purified angiogenesis molecule, the first angiogenesis inhibitor and proposed the concept of angiogenic disease. All of these discoveries have been translated into numerous clinical trials. Ten angiogenesis inhibitors are now approved by the FDA in the United States and several angiogenesis inhibitors are also approved in 30 other countries for the treatment of cancer and macular degeneration. Largely because of Dr. Folkman’s research, the possibility of antiangiogenic therapy is now on a firm scientific foundation, not only in the treatment of cancer, but of many non-neoplastic diseases as well. Dr. Folkman’s exceptional achievements have been recognized by many national and international awards. In 1990, he was elected to the National Academy of Sciences. He is also a member of the American Academy of Arts and Sciences, the American Philosophical Society, the Institute of Medicine of the National Academy of Sciences and Presidential appointment to the National Cancer Advisory Board of the National Institutes of Health. In addition to his distinguished accomplishments in research, Dr. Folkman has served as a surgeon and teacher. He began his career as an Instructor in Surgery for Harvard’s Surgical Service at Boston City Hospital, was promoted to Professor of Surgery at Harvard Medical School, and became the Julia Dyckman Andrus Professor of Pediatric Surgery in 1968. From 1967 he served as Surgeon-in-Chief at Children’s Hospital Boston for 14 years. He is the Director of the Vascular Biology Program in the Department of Surgery at Children’s Hospital. He holds honorary degrees from 17 universities and is the author of more than 400 original peer-reviewed papers and 109 book chapters and monographs. Paula Kim, Founder and President, Translating Research Across Communities (TRAC) and Principal of Paula Kim Consulting is recognized for her work in advocacy and bridging the gap between the research community and those with whom they must collaborate to accelerate research that benefits patients. Ms. Kim’s father died from pancreatic cancer in 1998, just seventy-five days after his diagnosis. Throughout her father’s illness and afterwards, she used the Internet to connect with researchers, patients, and families affected by pancreatic cancer. The tremendous need for improvement in patient services, early detection, treatments, awareness, and research funding for the disease was evident. Her lack of knowledge and experience in advocacy, public policy, and research did not diminish her determination to make a difference. In 1999, she co-founded the Pancreatic Cancer Action Network (PanCAN), the disease’s first and only national patient advocacy organization, serving as Chair and CEO between 1999 and 2004. During her tenure, PanCAN developed the first national programs for pancreatic cancer in patient services, national grassroots volunteer awareness, and privately funded career-development grants. Ms. Kim’s involvement with the patient, research, agency, and industrial communities is an important focus of her efforts and she was recently honored with the 2006 Society of Surgical Oncology James Ewing Layman Award, the 2004 American Association for Cancer Research (AACR) Public Service Award and the 2004 American Society of Clinical Oncology (ASCO) Partners in Progress Award. 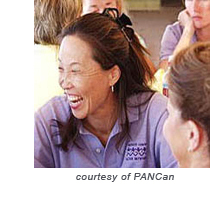 In addition to her professional work, Ms. Kim maintains longstanding commitments to volunteer service that preceded PanCAN and continues with service to the National Cancer Institute, the Food and Drug Administration, as well as with many researchers, cancer centers, and organizations around the world. Corporate Angel Network is the only charitable organization in the United States whose sole mission is to ease the emotional stress, physical discomfort and financial burden of travel for cancer patients by arranging free flights to treatment centers, using the empty seats on corporate aircraft flying on routine business. 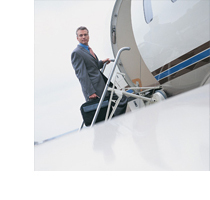 Based in White Plains, New York, Corporate Angel Network occupies an office donated by the Westchester County Airport. Fifty part-time volunteers and five paid staff work with patients, physicians, corporations, flight departments and leading treatment facilities to arrange 2,500 flights a year. Thanks to the generous cooperation of 500 of America’s top corporations, including 56 of the top 100 in the Fortune 500, Corporate Angel Network has coordinated more than 25,000 flights since it’s founding in 1981. The program offers an obvious and meaningful benefit to cancer patients along with the opportunity for companies with corporate aircraft to provide a wonderful community service by merging business activities with social responsibility.